Fishing a great way to pass the time, catch a great meal, and even hang out with family and friends. However, fishing is only fun if you have the best reel on the market and can brag about it to your family and friends. 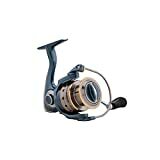 By knowing about the 3 best spinning fishing reels you can do exactly that. Not only that, you may even get to see if your friends have a reel that is good, but not among the top 3 on the marketplace today. This is a great reel that comes from Pflueger, who is a company that a lot of anglers will recognize. The reel is ultralight weight, but it does not mean the reel is going to cause you any problems. Instead, you will find this reel will make it easier for you to cast out, but also catch the fish you are looking for. While not specifically built for use in salt water it will work and can be used in a saltwater application. This model does come with only a 4 pound test, but it is 100 yards in length. So if weight is not a major issue for you, then you could end up getting a great buy here. Sometimes you are just going to want to get near the best reel on the market. That is what you are going to get with the PENN Spinfisher. This is a reel that is completely made from metal, but even better has the best Techno balanced rotor that will help make sure that your reel does not give you any fits when you are trying to haul in the big one. A great feature you will find with this is going to be the anti reverse lock. How many times have you tried to reel in the big one only to have your reel start to go backwards and you end up losing the fish because of this sudden movement with the reel causing the fish to bounce off of the hook. The Penn Battle II is easily the best reel on the market for spinning. This is a reel that has all the bells and whistles that you want to have. The Penn Battle II has a full metal body, including the side plate and rotor. The reel even has the added feature of 6 bearings that are going to help you in keeping the reel in good working order and help ensure the reel is not going to fail you when you are hauling in the big one. The drag washers is another great feature with this reel as they are made from the great quality carbon fiber. This means your drag washers is not going to wear out as quickly, but also they are going to function quite a bit better than the traditional washers that may end up failing in the middle of the catch. That concludes this spinning fishing reels review and we hope you get the right one to suit your needs. 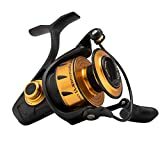 Copyright text 2018 Best Fishing Reviews | Reels, Rods, Tackle and more.